Reemay and the sea of white blankets that covers the 1/2 acre greenhouse each night throughout the deep winter months. This year, as the sole greenhouse apprentice, I had the pleasure of actually cutting and assembling these blankets with some of my fellow farmers and there really is no better way to gain an appreciation for something than by diving in and participating in the whole process (Hats off to all my former winter greenhouse apprentices). Before coming on full-time as a greenhouse apprentice, I would show up on Saturdays and the reemay would usually already be hanging up on the bungee cords, sometimes I would help tie it up or lay it back down over the beds at night, but I never realized just how much effort went into this process each and every day. But as with everything, through struggle comes strength and after a few days of fumbling around the system begins to get easier. Looking back at the cutting of ten 90 ft strips of Reemay for the 2012 winter blankets, you can see how important teamwork can be. A job that would have taken many hours alone was turned into a simple a fun project with the addition of a couple of knowledgeable and willing helpers. Some chalk, scissors, a tape measurer and a pare of sweet lady bug boots and the job gets done in no time. Setting attainable goals is also an incredibly important part of creating a positive and rewarding work environment. There have been many times when I find myself setting arduous and unattainable goals for accomplishing more tasks than I will physically have time to handle. In the end that type of planning only leaves room for increased stress and unmet expectations. Keeping it simple, manageable and within reason are all important. the metal wires are used to ensure that the Reemay doesn't sit directly on the plants or soil. As we know, Reemay helps retain heat and also holds in moisture. Although we want the heat, we don't want to have a major buildup of moisture as this can lead to unwanted fungi, moss and pest problems. 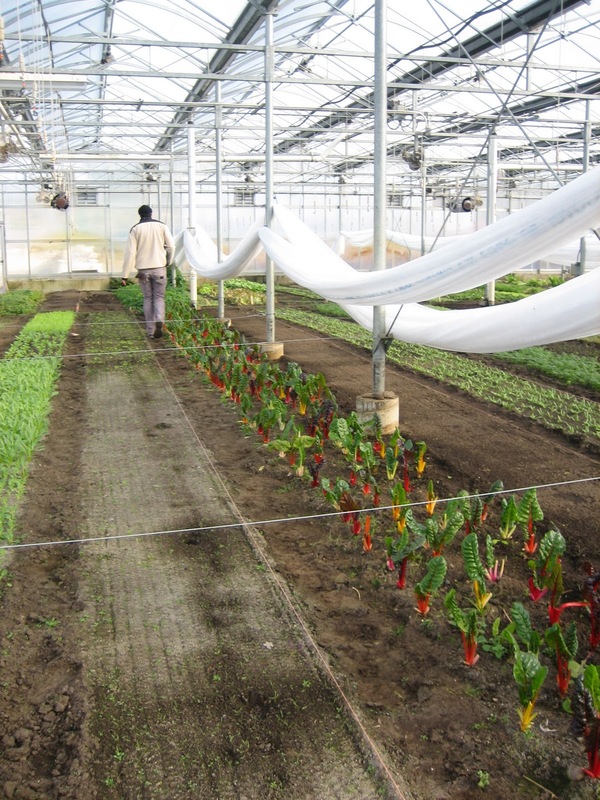 I think the simplest way to understand the positive effect of Reemay is that by putting these blankets over each bay, we are creating a greenhouse within the greenhouse. We know that greenhouses control climate and retain heat by having an enclosure over the plants. This is important in the winter because we want to retain as much heat as possible since the amount of sunlight is so low between the winter solstice and the spring equinox. 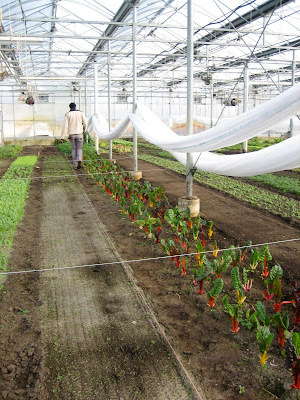 The placement about a foot above the plants, allows enough heat to circulate between the soil and the blanket keeping the ground from freezing. Along with the Reemay covers, we have some incredible and technologically advanced 99% efficient automatic heaters by True Leaf that provide both heat and carbon dioxide to the plants and soil. These heaters turn on anytime the greenhouse ambient temperature reaches below 35 degrees. This slight adjustment in temperature coupled with the natural 45 degrees underground allows us to use as little propane as possible while maintaining a reasonable temperature for the plants to flourish.